Pipevine Swallowtail (Battus philenor) butterflies are common here in Tucson during the warmer parts of the year, but I've had a difficult time photographing one of these active butterflies. 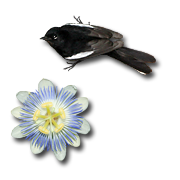 They move rapidly from flower to flower, fluttering their wings constantly as they feed, and then just as quickly fly away and are lost from sight. 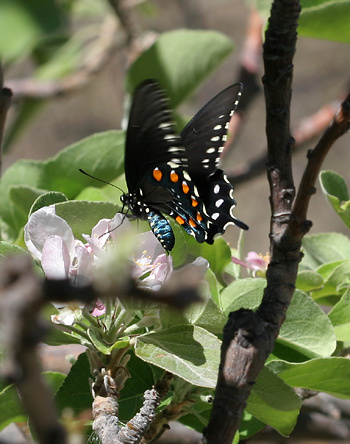 Yesterday, I finally captured a Pipevine Swallowtail with my camera for the briefest of moments at my blooming Apple (Malus domestica) tree. Pipevine Swallowtails are large, mostly black butterflies with up to 5 inch (12.7 cm) wingspans. 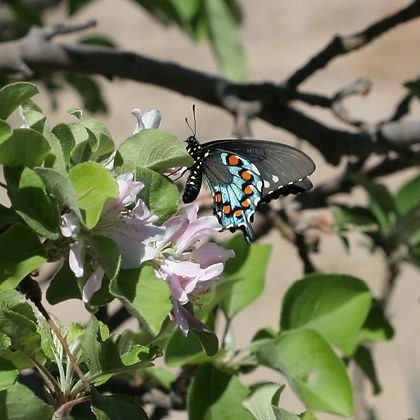 Their ventral hindwings have seven orange spots broadly surrounded by blue iridescence. Their dorsal hindwings have a row of white spots and are washed with blue iridescence in the males. 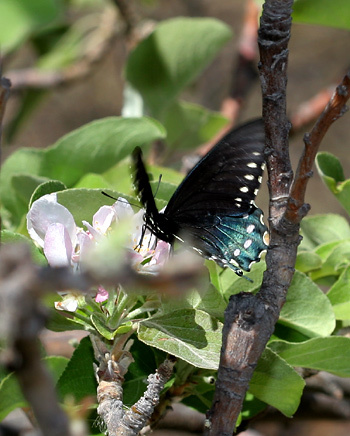 Like many other Swallowtail butterflies (family Papilionidae), Pipevine Swallowtails have a "tail" on each hindwing. This blue iridescence on the wings of a Pipevine Swallowtail is only visible at certain angles, and amazingly cannot be seen in the photograph of this same butterfly below. The bizarre-looking Pipevine Swallowtail caterpillars feed only on Dutchman's Pipes or Pipevines (Aristolochia species), and since these plants are poisonous, it's not surprising that the caterpillars are as well. The only native Dutchman's Pipe found here in Arizona is Watson's Dutchman's Pipe (Aristolochia watsonii), and its flowers are almost as bizarre-looking as the Pipevine Swallowtail caterpillars.